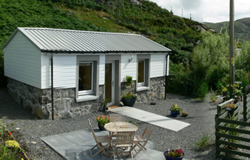 This well equipped self catering cottage on the shore of Loch Eynort offers excellent views of the sealoch and the surrounding hillsides. It is a renowned area for spotting all kinds of wildlife, including otters, seals, sea eagles and other birdlife. Opposite the cottage is a peninsula, a piece of land that juts out into the sealoch, it is a hundred yards or in length, fifty yards offshore at the end is a small island where seals bask. At some times of the year a hundred seals can be easily counted in the loch. Seal Cottage is a beautifully presented bijou and perfectly formed holiday cottage set across from the sealoch. Outside is a beautifully maintained garden to the front of the cottage with table and chairs for alfresco dining with views across the loch. The accommodation is a light bright and airy space with one double bedroom, open plan kitchen, dining and seating area. The cottage is centrally heated throughout. A short drive of no more than four miles away is the Askernish Golf Course, this historic course was designed by Old Tom Morris has become one of the finest links courses in Scotland giving any keen golfer a challenge! The course lies along the South Uist Machair and those who would prefer a walk can stroll the sands or wander amongst the wildflowers and hear the seals singing from a small island out in the sea. Fly fishing, hill walking and gentle strolls are all within easy reach by foot or a short drive away. South Uist has the best to offer for a relaxing, peaceful holiday or for more adventurous explorations! We are pet friendly and welcome well-behaved dogs, please ask when booking.